Johnny JonesJohnny Jones was born in 1936 in backwoods Tennessee. He left home when he was about 13 visiting Memphis where he witnessed the blues first hand in the Club Handy on Beale Street. He followed his mother to Chicago around 1950 and within a short period of time was hanging out at the 708 Club, where he began playing with Muddy Waters, Howling Wolf, Junior Wells, Little Walter and a young Freddie King. Leaving Chicago in 1957 to form his own road band, working in Wichita, Memphis, Clarksville and ended up in Nashville, Tennessee where he became a successful and prolific studio guitarist. During the Mid 1960's, Johnny played rhythm guitar in a backing band led by Clarence 'Gatemouth' Brown for a Dallas TV show 'The Beat'. This band accompanied artists including Etta James, Little Milton and Freddy King. Many of these shows are now available on DVD. In 1968 Jones moved to Atlanta and formed the 'The King Casuals' and recorded his first single 'Soul Poppin' on the Brunswick Label, followed by a nationwide road show backing Jackie Wilson and The Impressions. Jones' follow-up single - dedicated to his old friend Hendrix - was a powerful reading of his 'Purple Haze'. A few years later Johnny became disillusioned by all the travel and the headaches of keeping a band together and he retired from the music. However, in 1976 Bobby 'Blue' Bland came to Nashville to play a Blues Festival and at the last minute needed a replacement guitarist and Johnny was persuaded to pick up his guitar again and this led to him working with Bland permanently through to 1979 at which point he went into semi retirement working only in local bars and reluctant to travel far. 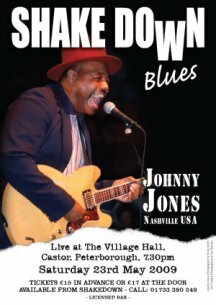 In the mid 1990's Johnny overcame his reluctance to travel and was a resounding success at The Estafette Blues Festival in Utrecht Festival in Holland which was followed by a week in the prestigious Lionel Hampton Club in Paris and led to a series of critically acclaimed CD releases between 1998 and 2000 at which point he again decided that he did not wish to travel anymore. In February 2007 after Doc Blakey's Castor show we were chewing the cud and Doc mentioned that his friend Johnny Jones would be a natural for us. 'A hard working showman with a great voice and a brilliant guitarist to boot'. We both became excited by the idea and he promised to put us in touch. Doc went back to the States and I waited for the call. Months passed, telephone messages were unanswered and I filed Johnny Jones amongst the 'almost happened'. Then out of the blue a call from Doc informed me that he had collapsed on stage shortly after returning from England; he was paralysed and rushed to hospital where he spent seven months recuperating. Thankfully he is now fully recovered, back on the road and regularly playing. He also informed me that he had spoken to Johnny who was happy to come to England together with Doc for a couple of Shakedown gigs - who could say no. Unfortunately, for whatever reason, Doc was unable to renew his passport in time for the trip to England and Johnny flew over to us on his own.